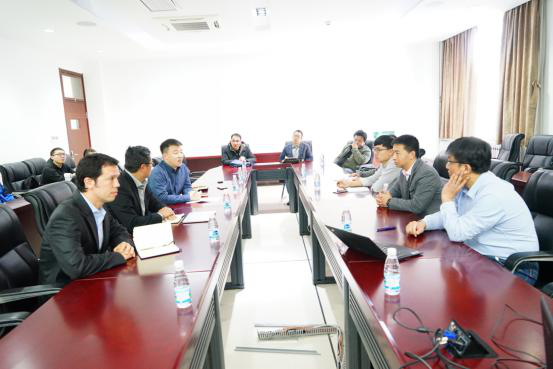 On March 21 and 22, Australian National University (ANU) Coordinator Jong Chow and Prof. Robert Ward pays a visit to Shandong University, Weihai (SDUW). Dean of SDUW Space Science and Physics WU Yingbo, Prof. LI Bo and Prof. WANG Shouyu has a meeting with guests from ANU, accompanied with related personnel from International Cooperation and Communication Office. During the meeting, both parties exchange ideas in depth about the fundamental information of SUDW-ANU joint education program. Prof. Chow speaks highly of students of SDUW in the past years and fully appreciates efforts made by SDUW on the students’cultivation. Both parties express desire and expectation on long-term cooperation in higher level and broader range. After the meeting, Prof. Ward meets with Year1 and Year 2 students majoring in Space Science and Physics and gives students a lecture.